Balega provides harmony in the fit, feel and performance of our socks that is founded on research, design, technical excellence and durability. Manufactured at our state-of-the-art facility in Cape Town, South Africa, utilizing the best performance yarns made in the United States. Balega's socks are the most technically advanced of any on the market. Specs (from package): Enduro No-Show (available in three colors): 77% Drynamix Polyester 21% Nylon 2%Elastane Ultralight (available in nine colors): 79% Drynamix Polyester 19% Nylon 2% Elastane Impressions (Geli): I am a big fan of socks! I definitely have favorites among all the choices in my drawer, and each morning try to find the perfect one for what the day has in stock for me. 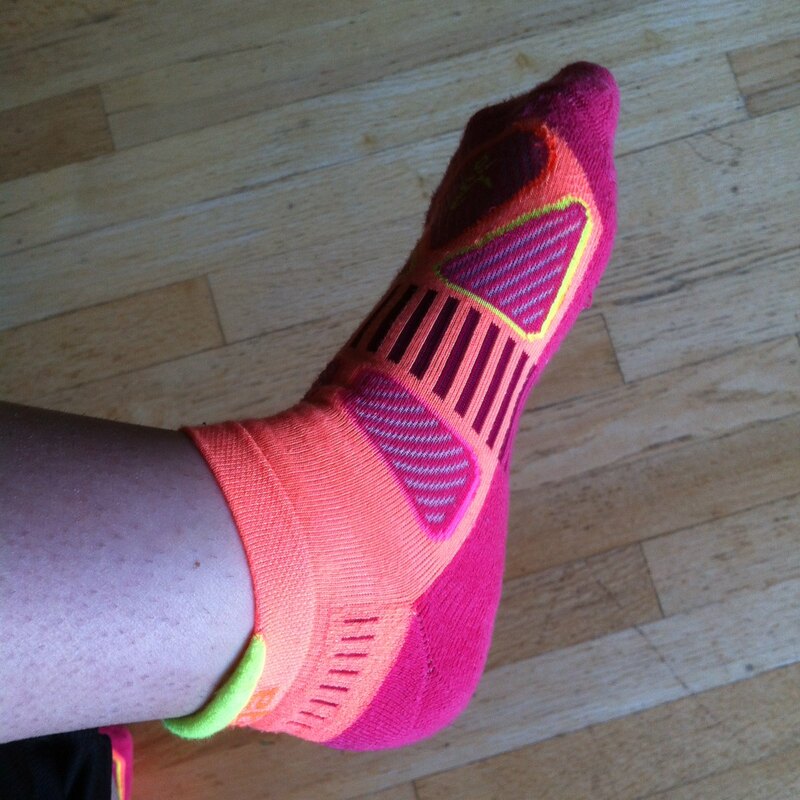 When I first put on the Balega Enduro No Show sock, I was impressed by its perfect fit for me: snug, but not binding. The arch support paired with cushioning in heel and toe feel like a gentle hug, and the seamless toe keeps my pinky toe happy all day. This is the first time I have seen a heel tab on socks, but since some socks lose their usability when they start slipping down the heel and into my shoe, I can see it very useful for long sock life. The Second Skin Fit Ultralight No-Show sock has very similar construction to the Enduro sock, but with an even finer knit and less cushioning in the heel and toe. The socks are marked left and right sock, making the fit even more perfect. They will keep your foot comfortable and cool throughout any length race, or for everyday wear. The longest distance I have worn the Enduro sock (aside from a full day at work) is a 10k run, and they felt nice for the whole duration, didn’t throw any wrinkles and didn’t cause any blisters. I hope the cushioning will keep the sole from wearing through too quickly (as my favorite running socks tend to do after a while), because they are definitely high on my list of favorite gear at the moment. If you are looking for something durable, comfortable, and reliable in the sock department, look no further than Balega. I had the pleasure of test running the Hidden Conture. The 200 thread count sock just might have you jumping for joy with the plush cushioning this sock provides. I wore these out on the trail in 75 degrees Fahrenheit (and it felt like 100 degrees!!) and while I was a sweaty mess in the sweltering sun, my feet (though hot) were not soaking. Balega states they use drynamix yarns for their moisture management. Whatever the exact science is, they are doing something right! The three elasticized zones offer support in the mid-foot, upper arch near the heel, and the ankle band. This is supposed to promote blood flow and the works with the natural movement of the foot. I found it very comfortable and if the thought of “extra support” or elastic-type zones sounds restrictive, push those thoughts out of your head and give these socks a chance. They are so worth it and just might be your favorite sock in your dresser drawer. The socks actually features full mesh ventilation panels which help with moisture wicking and keeping the feet cool. There is a “tab” on the back of the ankle band to help keep the sock from slipping into the shoe. I do know I had absolutely no problems s with the sock slipping. If the tab is not needed, it certainly doesn’t cause any issues and I jump for joy with a sock not sliding off my feet. 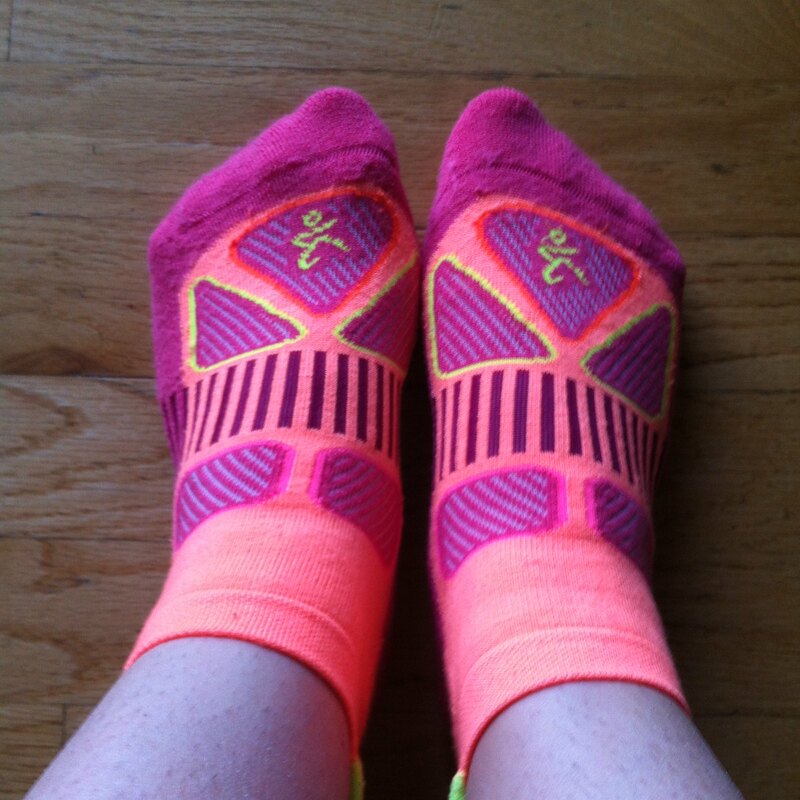 What favorite socks are your go-to foot gear? Give Balega a run.